In preparing to depart for our cruise, we needed to make preparations for Tyrone's vacation, too. He wasn't joining us on our cruise. 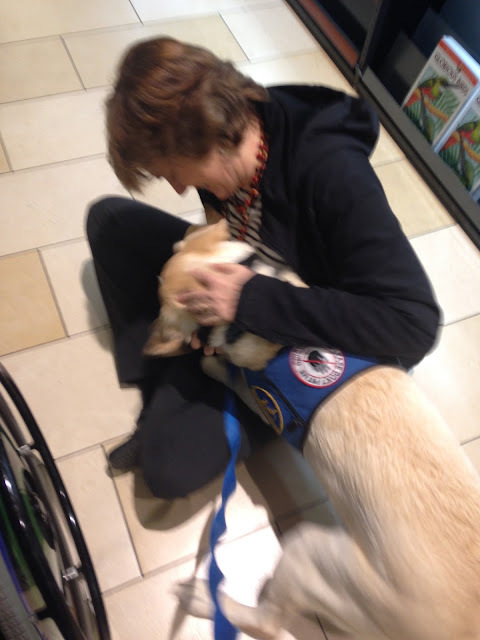 We had something more fun in store for him -- 10 fun-filled days with his puppy momma! Ty's puppy raiser, Ms. H, grew this fur baby from just a couple months old until he was 18 months. Those months of joy with a gentle leader and a yellow super-cape were blissfully innocent. They were followed by hard-core doggy boot camp, a no-mercy learning curve and strict obedience before he then was placed to serve in his official service dog assignment. Those first 18 months of Ty's life are ones that I want him to remember. And he does. They are all tightly contained in here. . .
And there is space for a LOT of memories in that whopper of a schnauze. Last year when we had met Ms. H to pass Ty along to be cared for in Bridger's absence, we learned that his ears hold all of those memories. We were meeting for the hand-off at a mall in Delaware half way between our respective homes. We were walking down the hallway of the mall pushing Bridger with Ty dutifully walking along side - vest on and in no-nonsense service mode, when Ms. H started speaking. Ty's ears perked up, his eyebrows lifted and he charged wondering what that familiar sound of loveliness was doing in a random mall. He charged - in absolute nonsense, very non-service mode, and practically jumped in the lap of the voice he recognized from his puppy days. Fast forward a year to this time that we were going to be making a handoff and I wanted to test his nose. Same mall. Different hallway. Ms. H was going to walk right by and not say a thing. Ty once again was all business, sauntering next to Bridger's wheelchair when she slowly walked by. I paused and let him catch a whiff of the pant leg. Within seconds she was toppled onto the mall floor. How embarrassingly unprofessional of him but completely appropriate at the same time. It was clear. There are a lot of happy memories he holds on to still.